With an abundance of whisks at hand in the store, I am frequently asked to recommend or pick a favorite. Here I have chosen my top three to share with you. All three of these whisks are chosen for their functionality, design and versatility. 1. Balloon Whisk/ Beater 12.6 inch – This whisk is a beast that will perform all of the tasks you ask of it and more. From hand beaten whipped cream, to voluminous egg whites, to decadent omelets and french toast, this whisk will aerate and fully blend whatever you want it to. Seriously, it’s a jack of all trades. 2. Flat Whisk 10.7 inch – This is a great sauce whisk for getting into corners of pans, for those of us without a saucier, it will work excellently for caramel, gravy, bechemel, hollandaise, even Beurre blanc. It works great in either stainless steal or silicone coated (for the non-stick pans we all keep around). 3. 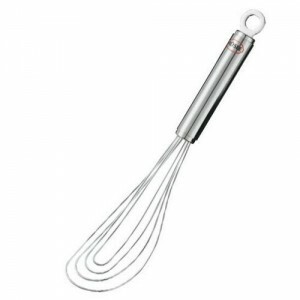 Twirl Whisk 10.7 inch – I love this whisk. Seriously. It is a great small batch whisk and is great for jobs with texture, like vinaigrettes. Nothing will get stuck in the middle here and everything gets whisked fairly evenly. What’s your favorite whisk? Why? Let us know!